Dearborn, MI - Carhartt, the nation’s leading brand manufacturer of rugged workwear produced in the United States, will begin manufacturing seven of its most popular products exclusively in the United States from materials that are sourced in the United States. These union-made products will be available for purchase beginning October 5. Hamilton Carhartt founded the company in 1889 with the intention of providing America’s workers with rugged and durable apparel. Since day one, Carhartt has manufactured in the United States and continues to do so today with factories throughout Kentucky and Tennessee. The company plans to continue expanding its “Made in the USA” line of products based on consumer demand. Carhartt does produce apparel both domestically and abroad to ensure it can provide American workers with the best fabrics and most durable construction at a competitive price. In 2011, Carhartt purchased more than 16 million pounds of cotton from American farms. Each of the “Made in the USA” products feature special labeling and packaging calling out the “Made in the USA” origin. 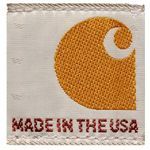 The “Made in the USA” apparel will be sold in retail locations across the United States through Carhartt authorized dealers, on Carhartt.com and through Carhartt’s company-owned stores. Established in 1889, Carhartt is a global premium work wear brand with a rich heritage of developing rugged apparel for workers on and off the job. Headquartered in Dearborn, Mich., with approximately 4,400employees worldwide, Carhartt is privately owned and managed by the descendants of the company‘s founder, Hamilton Carhartt. For more information, visit www.carhartt.com. I've got my eye on those Duck Detroit jackets. As soon as I can try one on, I'll likely be wearing one! Provided it gets cold enough here. Carhartt Dedicated to the USA!